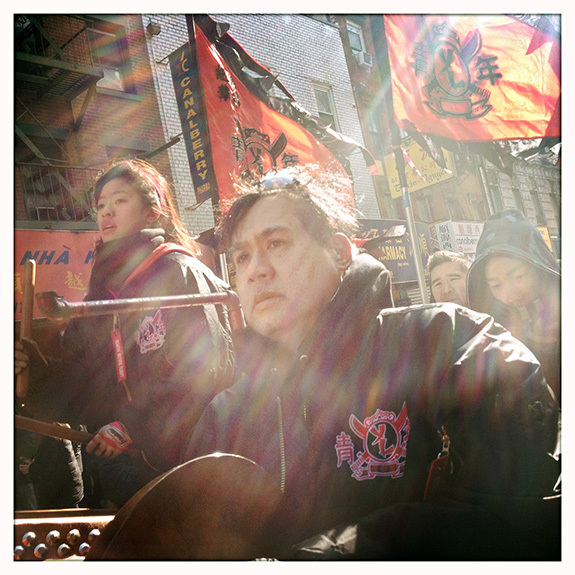 As a child, Brian Tom, now 52, was fascinated by Chinatown’s Lunar New Year celebrations. "Lion clubs would come out at night, and it's amazing for the senses: all the lights, the sound, the beating of the drums, the fire-crackers going off. By the age of 7, 8, I could play pretty well. It started out with pot lids as cymbals and my mom’s cooking utensils: wooden spoons and chopsticks on the bottom end of pans. I was banging away morning, noon and night, I definitely drove my parents insane." The son of a fourth generation NYC family, Brian didn’t fit into the traditional Chinese mutual aid societies, and many Chinatown associations had ties to organized crime and street gangs. So he and his friends started their own children’s lion dance group. "Back then, if you were not in a gang, you would be prey. The club ended up becoming a bit of a safe harbor: like a school of fish, we all stayed together. And the gangs sort of respected what we were doing, and most of the time left us alone." "Bruce Lee was emerging when I was a teenager, you know, there was no Jackie Chen, or Jet Li or anything like that. So you're looking for things to identify with, and there's gotta be more to Chinese culture than stir fried food and dumplings. In my wildest dreams, we never went out to build something that was gonna last for over 40 years. We were just a rag tag bunch of kids..."